It took me three years to write this article, and now that LACMA in Los Angeles is doing an exhibition on Merce Cunningham, I feel compelled to finish it. The reason I’ve taken so long is because Merce Cunningham’s body of work is immense and I just couldn’t figure out how to reign this article in. Plus, I mostly used books for this research so it took me forever. But rather than write a 500 page essay, I decided to focus on my favorite aspects of his work, and split this article into mini chapters, so apologies in advance for the fragmented essay, I just really want to get this thing out already! A pioneer in choreography, Merce Cunningham pushed the envelope with modern dance, giving birth to new dance forms that moved away from traditional ballet (though his technique is still very rooted in the structure ballet requires). Having first caught Martha Graham’s eye in the late 1930s while in college at the Cornish School in Seattle, WA, he was invited to join the Martha Graham Dance Company in New York City in 1939 where he danced for six years. As early as the 1940s, Cunningham was creating avant garde dance in collaboration with his life partner, John Cage. The two explored how dance and music could exist independently of one another rather than create dance movements dictated by the rhythm of its music. In 1953, Merce Cunningham started his own dance company, the Merce Cunningham Dance Company, creating what is now known as the Cunningham Technique during his time teaching at Black Mountain College outside of Asheville North Carolina (if you read these articles you know I’m obsessed with everything that came out of there). 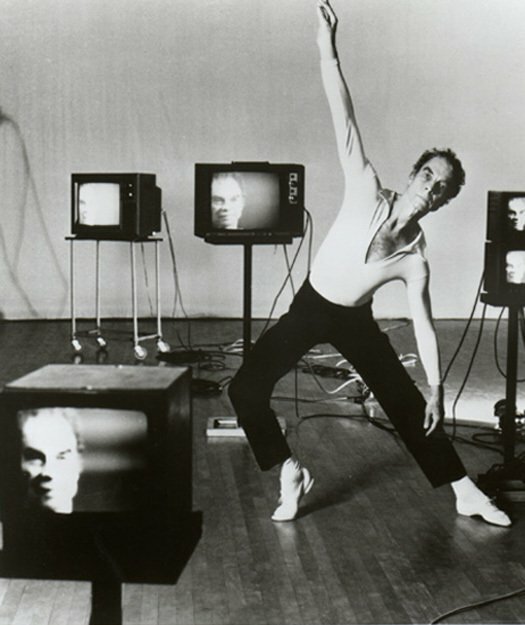 Around the time television started dominating the way in which people consumed dance, Cunningham opened his Westbeth New York studio in 1971, where the filmdance was born. His first filmdance was self-titled Westbeth, and was filmed over weekends in the Fall of 1974. (During this time, site-specific performance was just starting, and naming his first piece Westbeth was no coincidence). The amazing thing about the Westbeth studio was that it had been made for television filming, which is one of the reasons Cunningham was drawn to the space. In New York, many large rooms have columns obstructing the open space, but this studio was originally Bell Telephone Labs in the West Village, which happened to be the studio where the first television transmission had taken place sometime in the early 1930s. During my studies on the Westbeth performance, I ACTUALLY FOUND THE FIRST RECORDING of its performance! The early filmdances weren’t yet perfected, so it wasn't until his third filmdance, Locale (1979-1980) that film was shot continuously with no cuts. Being the collaborator that he was, Merce Cunningham hired filmmaker Charles Atlas to join his technical staff when he opened the Westbeth studio, and it was Atlas who played a large role in honing in on how to best film these filmdances. In addition to the studio being perfect for filmdance, Westbeth had an office whose windows looked out onto the city streets. Many of the movements Cunningham used during this time were based on the movements of pedestrians he saw moving about New York City from his office windows. This is why though some gestures in Cunningham’s work seem odd for dance, they are still somewhat familiar. Now, to go back to the beginning since Cunningham’s story is long and super interesting, I’d like to discuss some of the dance events that led Cunningham to his film dances. While dancing with The Martha Graham Dance company, Cunningham held his first solo performance, which was in collaboration with his partner, John Cage. Experimental in nature, the performance Root of an Unfocus in 1944 was Cunningham’s first public performance where dance and music worked independently of each other. The dance was created after Cunningham realized, “Music and dance could be separate entities independent and interdependent, sharing a common time.” Regarding this performance, Cunningham later stated, "The main thing about it–and the thing everybody missed–was that its structure was based on time in the same sense that a radio show is. It was divided into time units, and the dance and music would come together at the beginning and the end of each unit, but in between they would be independent of each other. This was the beginning of the idea that music and dance could be dissociated, and from this point on the dissociation in our work just got wider and wider" (Common Time, Meade). Cage & Cunningham met in Seattle in 1938 where Cunningham was studying dance at Cornish School. Cage was the new dance accompanist and composer there. (Cage had just moved from Carmel, CA with his then-wife). Cage was exploring the "simultaneousness of music" and would break down time in terms of ‘divides of time and space,’ drawing on the floor to demonstrate his guidelines. Cunningham saw Cage’s approach as a strict way to guide movement in ways that the traditional relationship between dance and music had not before. Cage was a very interesting man himself. At the age of 19, Cage dropped out of college and went to Bauhaus school in Dessau during 1930-31. Being exposed to Bauhaus' interdisciplinary approach to art, Cage returned home to create music from unconventional instruments such as anvils and car parts in the late 1930s. By the 1940s, Cage had created new sounds with what he called a "prepared piano," lodging screws or rubber between piano strings to affect tonal changes. The avant garde approach John Cage took with his music was a perfect fit for the way Merce Cunningham wanted to explore dance, and so the two became collaborators, eventually leading to their relationship as life-partners. Following Cage's first use of “chance in music” in 1950, Merce Cunningham tossed a coin to determine the outline for a sequence of isolated movements through the use of chance, and then pieced them together for "unexpected results." Through the use of chance, Cunningham was able to achieve movements that he had thought couldn't be done. The impact of John Cage’s perspective can be seen throughout the arc of Cunningham’s creative life. Complimenting one another so well, the result of their more than 500 collaborations is impressive. After leaving the Martha Graham Dance Company, Merce Cunningham spent three "formative summers" at Black Mountain College in 1948, 1952 and 1953. To me, Black Mountain College is like the Bauhaus School of the United States. So many important artists came out of Black Mountain College. Also due to WWII, some artists of the Bauhaus School ended up in the US, eventually teaching at Black Mountain College as well, and with them, they brought their interdisciplinary approach. One such Bauhaus artist, Josef Albers, worked at Black Mountain College from 1933 - 1949. (I love him, read this article I wrote on Albers a while back if you care to). In 1948, the same year that Cunningham and Cage first visited the school, Albers invited them back as teachers and performers in the school’s Summer Sessions. That year’s summer session is now considered legendary, as heavy hitters of the American art world all convened there before many of them earned the fame they have today. (For a good article about this summer session, go here). During their time participating at Black Mountain College, Cunningham and Cage were still based in New York, where Cage was teaching at the New School. And as I mentioned, in 1953, Cunningham formed his company, the Merce Cunningham Dance Company. Being the collaborator that Merce Cunningham was, he hired the company’s first art director, Robert Rauschenberg in 1954 after working together at Black Mountain College. Cunningham asked Rauschenberg to make something for 'dance area' something "he could move through, around, and with” and from there, Rauschenberg created amazing sets and costumes for Cunningham dances for several years. (I ran a piece on Rauschenberg’s role with the Cunningham Dance Theatre a while back. If you’d like to read that, go here). After forming the Merce Cunningham Dance Company, Merce collaborated with many others, including Rei Kawakubo, the designer for Comme Des Garcons. Merce Cunningham lived until 2009 and I will say that not attending one of his workshops before his death is one of my few regrets in life but at least his work is memorialized in Cunningham Technique courses all over the world.